Fly your flag today for the 2019 holiday honoring Rev. Martin Luther King, Jr.
Marchers from Selma to Montgomery carried the U.S. flag; you should fly yours today in honor of Martin Luther King, Jr. Image from 60s Survivors page on Joanna Bland, who was part of the march. Citizens and residents of the U.S. should fly their U.S. flags today, on the holiday marking the birth of the Rev. Dr. Martin Luther King, Jr. 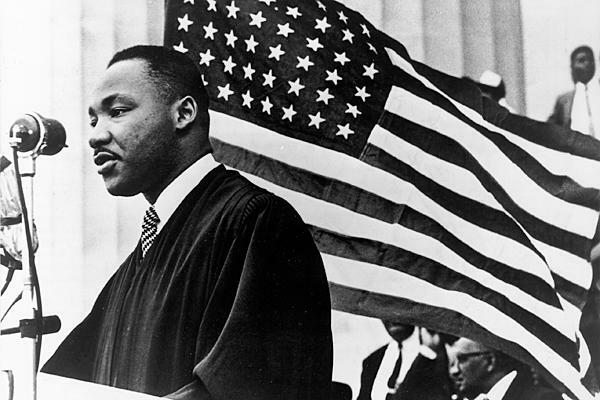 Fly the U.S. flag today for the holiday for the birthday of Martin Luther King, Jr. The holiday is celebrated on the third Monday in January. King’s actual birthday is January 15. In 2019, the legal holiday is January 21, today. It’s becoming common for Americans to fly their flags all weekend for a holiday on Friday or Monday. Many Americans will celebrate with a day of service. Perhaps you will, too. In 2019, in a nation that seems again intolerant of immigrants and people of color, remembering and honoring the life and struggles of Martin Luther King, Jr., and serving others in real and symbolic ways, is more important than ever. U.S. Rep. Beto O’Rourke, D-Texas (El Paso) in a House committee hearing room. Relevant Magazine image. U.S. Rep. Beto O’Rourke reaches out to every Texan in his campaign for the U.S. Senate seat occupied by Ted Cruz. O’Rourke already visited all 254 Texas counties, listening to Texans tell him what is important in their lives. Now Beto conducts town hall meetings. Recently a Texan asked him about NFL players’ kneeling during the national anthem. Does his answer surprise you? It reveals the thought he’s put into issues. Tip of the old scrub brush to Now This! on Twitter. How Congress voted on the Civil Rights Act of 1964, broken down by party and with a few more details; chart by Kevin M. Kruse; from Kruse’s Twitter account. Not sure if everybody got their Bogus History from Dinesh D’Souza, but a lot of people have the same wrong ideas about what party supported civil rights in the post-World War II era. These crappy distortions of history are showing up on Facebook and all over Twitter. Worse, people believe them. The crappy claim is that Democrats are the party of racism and support for the Ku Klux Klan. Historically, that was once so; but it has not been so since 1948 as the two main parties in the U.S. switched positions, with Democrats taking on civil rights as a key cause for Democratic constituencies, and the Republican Party retreating from Abraham Lincoln’s work in the Civil War and immediate aftermath, and instead welcoming in racists fleeing the Democratic Party. Think Strom Thurmond, vs. Mike Mansfield and Lyndon Johnson. Kevin Kruse corrected D’Souza in a series of Tweets, and you ought to read them and follow the notes. Kruse is good, and better, he is armed with accurate information. This is solid history, delivered by Kruse in a medium difficult for careful explanations longer than a bumper sticker. Mr. Kruse made a key point early in the thread. First of all, the central point in the original tweet stands. If you have to go back to the 1860s or even the 1960s to claim the “party of civil rights” mantle — while ignoring legislative votes and executive actions taken in *this* decade — you’re clearly grasping at straws. Anyone who reads newspapers would know that. Alas, one of the campaigns of conservatives over the past 40 years has been to kill off newspapers. They’ve been way too successful at it. I’ll include mostly the Tweets for the rest of this post. First of all, the central point in the original tweet stands. If you have to go back to the 1860s or even the 1960s to claim the "party of civil rights" mantle — while ignoring legislative votes and executive actions taken in *this* decade — you're clearly grasping at straws. Second, this fact — that GOP votes were needed to overcome the opposition of Southerners in Congress (Democrats *and* Republicans) — is weirdly trotted out as if it's a hidden secret and not, you know, a central part of historians' narrative of the civil rights era. This is a constant thing with D'Souza, by the way, claiming "historians won't tell you this" or "they don't lecture about that" when, in fact, we do constantly. It's a fairly big tell that he hasn't read much in the field and probably never even took a class in US history. It’s a big tell. See my earlier posts on the 7 Warning Signs of Bogus History. Anyway, let's dig in to the talking point. Yes, a higher proportion of Republicans *did* vote for the Civil Rights Act and Voting Rights Act. Yes, their votes were crucial to passage of each. But they were junior partners in the process, and soon marginalized in their party. In 1964, Dems had nearly a 2-to-1 margin in the House (258 D, 176 R); in 1965, more than a 2-to-1 margin (295 D, 140 R). In 1964, Dems had nearly a 2-to-1 margin in the Senate (64 D, 36 R); in 1965, more than a 2-to-1 margin (68 D, 32 R). Democrats were the dominant party, but had become increasingly divided over civil rights, with northern white liberals and African-Americans steadily gaining on the southern conservative segregationists who had long controlled the party. Because Democrats had such overwhelming margins in Congress but were divided internally on civil rights, the fight over the CRA and VRA were at heart fights *within* the Democratic Party. Liberal Dems fought for these bills; conservative Dems worked to stop them. Look at the history behind both bills, before the final votes. Both were introduced by Democratic presidents, ushered through Congress by Democratic committee chairs and leaders, given more votes in the end by Democrats than the GOP, and then signed by Democratic president. The Civil Rights Act of 1964: proposed by JFK, passed by Democratic-led House (152 Dem votes for, 138 Rep votes for) and Democratic-led Senate (46 Dem votes for, 27 Rep votes for). LBJ signed it with MLK at his side. The Voting Rights Act of 1965: advanced by LBJ and passed by Democratic-led House (221 Dem votes for, 112 Rep votes for) and Democratic-led Senate (49 Dem votes for, 30 Rep votes for), LBJ signed it. In comparison, Senator Barry Goldwater — the conservative GOP presidential candidate who ran against LBJ in 1964 — voted against the Civil Rights Act and campaigned on the vote. Back up and look at those vote totals for the bills. You can see Democrats and Republicans on both sides. Yes, Southern Democrats in the Senate filibustered the CRA. But the only Southern Republican senator filibustered too, and the filibuster's leader soon switched to the GOP. On the flip side, yes, liberal and moderate Republicans did side with the majority of Democrats to pass the bills, after Dem leaders recruited them. D'Souza and those like him point to the yes votes of liberal & moderate Republicans — deliberately ignoring the no votes of conservatives like Goldwater — to claim that today's *conservative* GOP is the party of civil rights. At the time, conservatives were engaged in civil war with these liberals and moderates, trying to drive them out of the Republican Party. Over time, conservatives succeeded in cementing a new identity for the GOP, with civil rights increasingly becoming a major distinction. This was evident in public polling at the time. In 1964, only 7% saw the GOP as better on civil rights. SEVEN. PERCENT. In 1960, a lengthy, detailed section on civil rights. In 1964, only a few lines. So, no, the GOP was not "the party of civil rights" in the 1960s. In the end, it's insane that conservatives now try to reach back to reclaim votes of moderate and liberal Republicans — whom conservatives *hated* at the time — to provide cover for today's conservative GOP. Sorry, you didn't want them then. You don't get to claim them now. This is mostly an encore post; please holler quickly if you find a link that does not work. 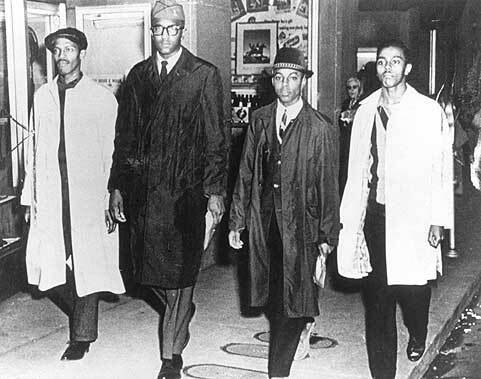 Four young men turned a page of history on February 1, 1960, at a lunch counter in a Woolworth’s store in Greensboro, North Carolina. 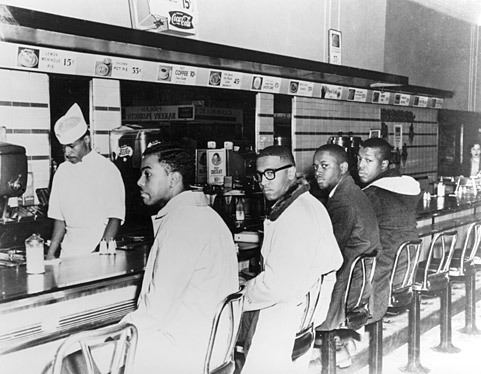 Ezell A. Blair, Jr. (now Jibreel Khazan), Franklin E. McCain, Joseph A. McNeil, and David L. Richmond, sat down at the counter to order lunch. Because they were African Americans, they were refused service. Patiently, they stayed in their seats, awaiting justice. On July 25, nearly six months later, Woolworth’s agreed to desegregate the lunch counter. One more victory for non-violent protest. News of the “sit-in” demonstration spread. Others joined in the non-violent protests from time to time, 28 students the second day, 300 the third day, and some days up to 1,000. The protests spread geographically, too, to 15 cities in 9 states. Part of the old lunch counter was salvaged, and today is on display at the Smithsonian Institution’s Museum of American History. The museum display was the site of celebratory parties during the week of the inauguration as president of Barack Obama. Part of the lunch counter from the Woolworth’s store in Greensboro, North Carolina, now displayed at the Smithsonian’s Museum of American History, in Washington, D.C.- photo from Ted Eytan, who wrote: [“Ever eaten at a lunch counter in a store?”] The words . . . were said by one of the staff at the newly re-opened National Museum of American History this morning to a young visitor. What she did, very effectively, for the visitor and myself (lunch counters in stores are even before my time) was relate yesterday’s inequalities to those of today, by explaining the importance of the lunch counter in the era before fast food. 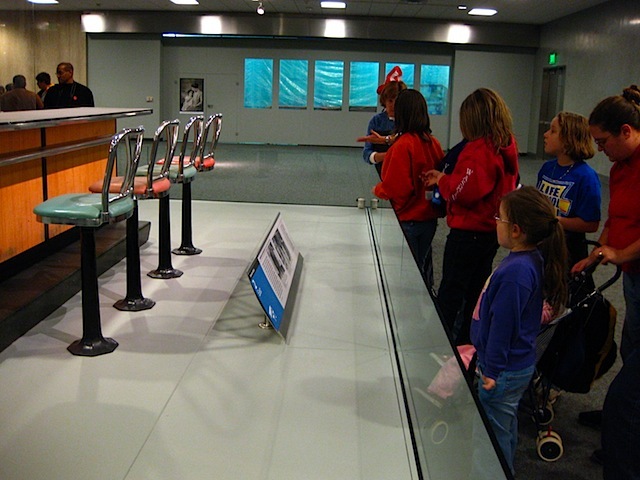 This is the Greensboro, North Carolina lunch counter, and it was donated to the Smithsonian by Woolworth’s in 1993. F. W. Woolworth’s, a “five-and-dime” style store, largely closed its U.S. operations in 2001, though changing its focus to the Foot Locker shoe stores. One of its last remaining stronghold of 807 stores, in Great Britain, was shuttered at the end of 2008. It was a long fight. Fly your flag today for the 2018 holiday honoring Rev. Martin Luther King, Jr.
As on every federal holiday, citizens and residents of the U.S. should fly their U.S. flags today, on the holiday marking the birth of the Rev. Dr. Martin Luther King, Jr.
King’s actual birthday is January 15. In 2018, the legal holiday and King’s actual birthday are the same day. It’s becoming common for Americans to fly their flags all weekend for a holiday on Friday or Monday. In 2017, days before the inauguration of a new president, remembering and honoring the life and struggles of Martin Luther King, Jr., and serving others in real and symbolic ways, is more important than ever. 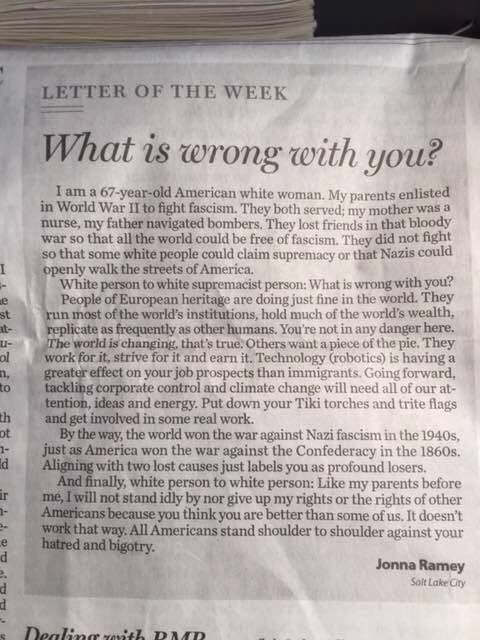 Letter of the week: What is wrong with you, white supremacists? Letter-to-the-Editor of the Salt Lake Tribune, August 20, 2017. “What is wrong with you?” Open letter to white supremacists, in the Salt Lake Tribune, by Jonna Ramey, August 20, 2017. Image maker unknown. I am a 67-year-old American white woman. My parents enlisted in World War II to fight fascism. They both served; my mother was a nurse, my father navigated bombers. They lost friends in that bloody war so that all the world could be free of fascism. They did not fight so that some white people could claim supremacy or that Nazis could openly walk the streets of America. White person to white supremacist person: What is wrong with you? People of European heritage are doing just fine in the world. They run most of the world’s institutions, hold much of the world’s wealth, replicate as frequently as other humans. You’re not in any danger here. The world is changing, that’s true. Others want a piece of the pie. They work for it, strive for it and earn it. Technology (robotics) is having a greater effect on your job prospects than immigrants. Going forward, tackling corporate control and climate change will need all of our attention, ideas and energy. Put down your Tiki torches and trite flags and get involved in some real work. By the way, the world won the war against Nazi fascism in the 1940s, just as America won the war against the Confederacy in the 1860s. Aligning with two lost causes just labels you as profound losers. And finally, white person to white person: Like my parents before me, I will not stand idly by nor give up my rights or the rights of other Americans because you think you are better than some of us. It doesn’t work that way. All Americans stand shoulder to shoulder against your hatred and bigotry. Kathryn found the letter on Facebook somewhere. Since we both have Utah roots, and anchors sometimes, the venue alone made it interesting. On Facebook it came with a link to Leigh Melander, who turns out to have an affiliation with the Joseph Campbell Foundation (JCF). You remember, Campbell’s series of interviews with Bill Moyers a few years ago became a hit television series. Melander seems to be an interesting voice in her own right. How did Melander chance across that image from the paper version of the letter in the Salt Lake Tribune? Wouldn’t it be amazing if supremacists paid more attention to Joseph Campbell’s informed and hopeful outlook on use of myth to bring peace and happiness, instead of inventing false claims to drive hate? Hate and discrimination are expensive. We can’t afford them.